In our society we have people with disabilities. Even if the technology is developing day by day no significant developments are undertaken for the betterment of these people. We have thus planned to create a product as a part of our project. In future it may become a widely used technology for helping the handicapped people. We aim for developing an FPGA based hand gesture recognition system for establishing communication between the deaf and the dumb people. The main platform in the project is FPGA which is Field Programmable Gate Array. It helps to generate a real time system which can decode the gestures. It makes the system fast and efficient. Image acquisition is done with a digital camera. The acquired image is then processed using efficient algorithms. 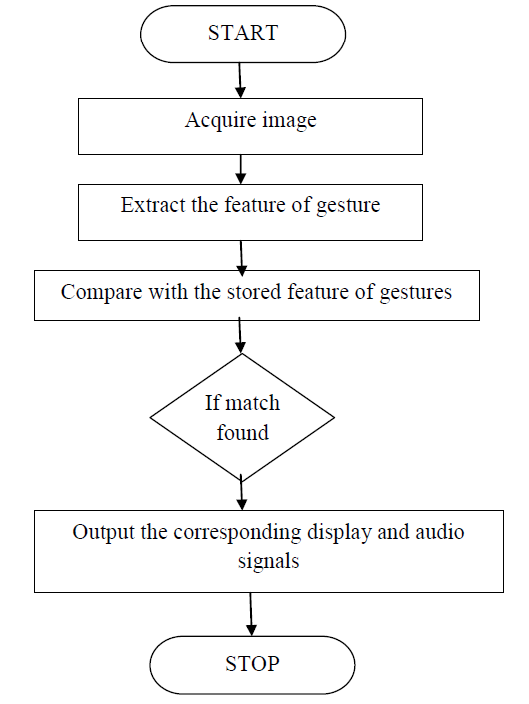 Edge detection and feature extraction is done to correctly identify the gestures. The images of the required gestures are all stored and then it is compared with features extracted from the acquired image. Accordingly audio and visual output is generated. This will help in establishing an efficient communication between the deaf and the dumb. Regarding the effectiveness of the project we can expect it to be very effective once it becomes a chip after being given to the ASIC. It will help the dumb to communicate even though they can.t speak. It is a matter of social significance. It is also of great importance that the message is conveyed correctly. So this idea may promote the social set up of our nation. Hence all technical difficulties of implementing such a real time system should be overseen and it must be made a blessing to the handicapped. This project aims n uplifting them and allowing them to live like all other normal human beings. We have almost achieved our aim in this project. We have successfully implemented image processing algorithms in FPGA. We have realized UART module through FPGA. It is used in capturing and transferring the image to the board. We have also completed LCD programming and successfully implemented the same. LCD is used for getting a visual representation of the decoded gesture. We were successful in obtaining almost accurate results as well. The audio circuitry has also been successfully implemented. It gives an audio of the recognized gesture. All simulations have been done successfully. A little part of synthesizing is remaining which will give out the final product. The project was all about creating a system which will be helping to establish a communication with the deaf and the dumb. But we have proposed only the FPGA implementation of the same. In future it can be made into a chip so that it can be launched as a product. So far we have made use of only static gestures which are conveying some words rather than just alphabets. This can be extended to a level wherein we are detecting the dynamic gestures can be detected. A high definition video camera can be used for the same. Motion can thus be identified. We have used an audio IC which can store only 8-9 audio outputs. If we use an mp3 player for the same the system becomes more self sufficient so that we can use many more audio files for the same. When integrated to make into a chip also it will be helpful. The scope of the project now is limited because only selected gestures are being identified and also it is based on a single person or so. This can be expanded in the future to many more commonly used gestures by the dumb. Also more efficient algorithms can be implemented to undertake filtering the image acquired by the camera. Then the system will be blessing for many.